Bruschettas With Mushrooms, Sweet And Sour Apple Sauce And Parma Ham. Today I am sharing these Bruschettas with Mushrooms, Sweet-and-Sour Apple Sauce and Parma Ham from Consorzio del Prosciutto di Parma. Porcini mushroom season has finally arrived and with it hundreds of delicious recipes. Commonly known as “penny bun” in the UK, these fine mushrooms with a meaty texture and earthy fragrance give a deep, woodsy flavour to a variety of plates. 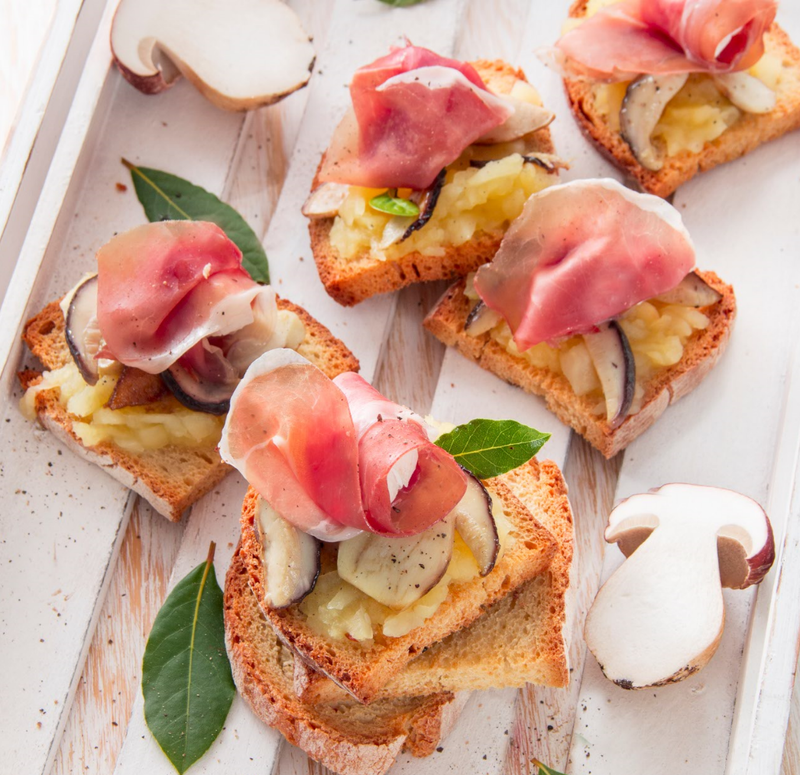 These Italian bruschettas featuring Parma Ham and tasty Porcini mushrooms are a great option for autumn celebrations. To start preparing the Porcini mushrooms, brown a clove of crushed garlic and a bay leaf in a frying pan with oil. Then, add the sliced Porcini mushrooms and cook for about 7 minutes before dousing with wine. Season to taste with salt and pepper. To cook the sauce, start by peeling and dicing the apples. Put them in a frying pan with caster sugar, butter, salt and pepper and cook for 10 minutes. After, add the vinegar and allow it to evaporate. When the apples are nice and soft, add the startch and stir. To make the bruschettas, cut the slices of bread in halves, arrange them on a tin covered with baking paper, grease and toast them in a hot oven. Take out of the oven and top each slice with the sweet-and-sour applesauce, the mushrooms and a slice of Parma Ham. To add the final touch, garnish with bay leaf and serve. What do you think of this Bruschettas with Mushrooms, Sweet-and-Sour Apple Sauce and Parma Ham recipe? Parma Ham and Grapes with Fried Dough. 4 Quick & Easy Prosciutto di Parma Ham Naan Bread Pizzas. How To Make Parma Ham, Asparagus and Parmigiano Reggiano Dippers with Soft-Boiled Duck Eggs Recipe. Camembert Fondue With Parma Ham-Wrapped Grissini Dippers. Filo Pastry Tartlets With Cheese-Flavoured Coarsely Ground Semolina And Parma Ham. "Christmas Dresses From Want That Trend Review"
"24/11/2017 Welcome To The Weekend Blog Hop"